In these pages you will find information about the centre and its staff (both animal and human). There is information about our lessons, which we provide for both adults and children, pony days and other events.You will also find links to contact us, and some history about the Centre based in Warwickshire. We at Holly Riding School are very excited by the opportunities this site presents to keep in touch with you, our customers, and to be able to share with you all the latest news from the Centre. The Centre has been open since 1976 and in that time we have taught thousands of students to ride from Warwickshire, Staffordshire and the West Midlands. Over the last few years the centre has had some considerable improvements and are now quite proud of the new improved look and feel. We pride ourselves on being a family friendly centre with a strong community feeling and an emphasis on safety and fun. When using a BHS approved centre you can be sure that all the stringent criteria for the approval have been met. This includes a vast range of specifics for the quality of teaching, the standard that our horses are cared for, the facilities and also important issues like employers’ liability insurance and public liability insurance. All our staff are DBS checked, have attended Child Protection Courses and BHS 1st Aid approved. The Pony Club Centre Membership Scheme was introduced in 1998 so that children and young people without their own pony could join and take part in Pony Club activities. Again becoming a member of this prestigious and beneficial organisation means that we had to meet tough standards in order to achieve our acceptance and these standards are there to give you peace of mind. The Pony Club Progressive Tests are completed within our weekly class riding lessons and badges are completed during Pony Days and Rider Courses. Certificates are completed on specific days with a representative from the Pony Club. Please respect we are CLOSED Bank Holiday Monday. 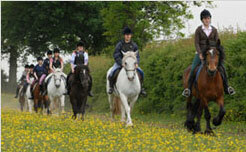 PONY CLUB AFTER SCHOOL CLUB ON A MONDAY EVENING 4:30 TO 6PM COSTING £10 PER SESSION. WE WILL BE WORKING ON PONY CLUB BADGES AND CERTIFICATES. Please email for more information. Adult only group riding lesson on a Wednesday evening. Bookings now being taken for Spring and Summer activities.